The Principal Diaries - The Annual Plan and putting the plan into action! 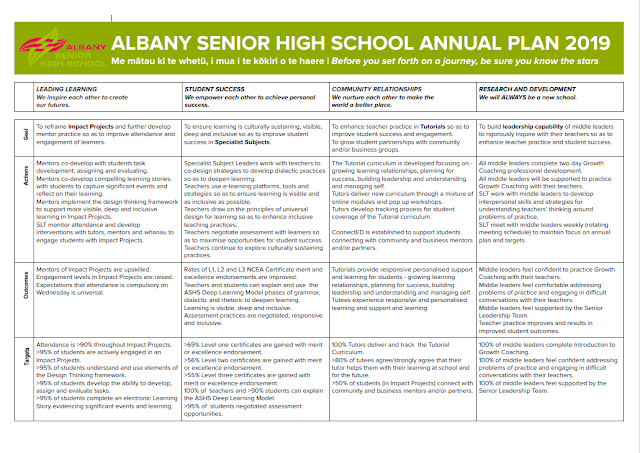 It was an interesting process pulling together my first annual plan as Principal at Albany Senior High School. 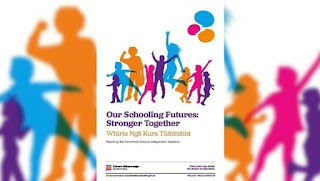 School Charters and Annual Plans are interesting beasts. To be honest, they appear to be box ticking waffle and weasel words which gather cyber dust in some virtual filing system. Well, the first term has felt like something of a whirlwind. It has been a case of of hitting the ground running and any other whirling/high speed metaphors you can think of. Partly this was due to the time of year - being a senior school, the third term ends up feeling like the (nearly) end of the year, with Impact Projects coming to an end this marked a flurry of exhibition, performance and celebratory evenings. The other reason that it has barreled along so quickly is that I was determined to act quickly so as to ensure plans were well and truly in place for 2019. The Principal Diaries - Getting ConnectED with our community! And finally, I am leader who can build powerful partnerships and networks. I have experience in developing productive and warm relationships with local schools to establish a highly effective Kāhui Ako. I bring in depth experience gained as a Projects Pathways and Partnerships Leader and as an Impact Project Guide, having worked with the community and business sector to create rich and authentic learning partnerships for our students. 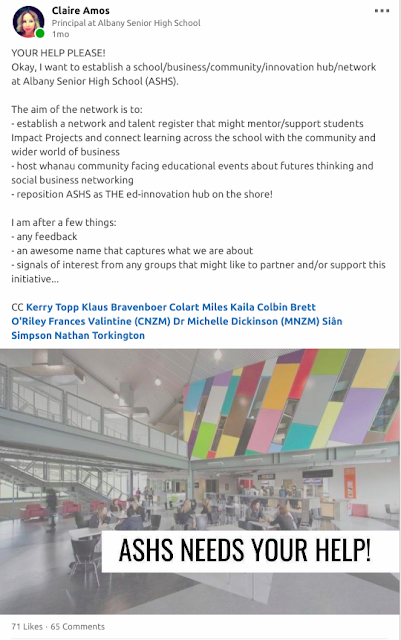 As Education Advisor for the 21st Century Skills Lab and as a board member of NetSafeNZ I have experience that spans across the education and business landscape. I have fostered a vast education, community, innovation and business network that will support the growth and expansion of powerful partnerships for this school and it’s learners.